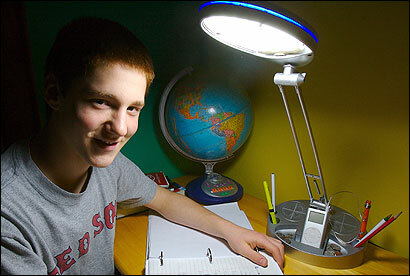 Gabe Stillman loves his iLamp . He puts it on his desk while he's doing homework and moves it to his bedside table for the late-night hours. Not only does it throw good light, it plays Stillman's music collection. The iLamp is outfitted with built-in speakers and a docking port for iPods, making every one of Stillman's 850 downloaded songs a finger tap away. It couldn't be more convenient. It could, however, sound better. "I know that a lamp with speakers is a bunch of hooey but it does the job," says Stillman, 15, who plays saxophone in the Milton High School jazz band and considers himself a serious music fan. Still, he uses the tiny ear buds that came for free with his iPod when he's snowboarding. "They sound even worse than the iLamp, but they fit under my hat." Stillman is part of a generation that does not care how big its speakers are. For increasing numbers of consumers, mostly young but also many older music fans, listening in the digital age means ease and portability, not sound quality. Still, in an effort to make high fidelity a higher priority, the technology industry is introducing high-end ear buds, add-on gadgets that promise CD-quality sound on an iPod or computer, and other products. More than 580 million digital tracks were purchased during 2006, according to Nielsen SoundScan , an increase of 65 percent over 2005. (And that's not counting illegally downloaded songs.) Yet when a song is compressed to fit into a digital format -- MP3 files and equivalents used by Apple's iTunes store and Windows platforms, including Napster -- some portion of the original audio is lost. In the transferring of recorded music onto a digital file, the goal is to discard the information that will be missed least by the human ear. But the losses are audible and can be dramatic, depending on the bit rate at which a digital file is downloaded. Bit rate defines the amount of space used for storing digital data; a higher bit rate translates to better sound quality. Audio stored on a compact disc has a bit rate of 1411.2 kilobits per second. By contrast, a typical downloaded music file has a bit rate of between 96 and 320 kilobits per second, which means that most of the songs we listen to on our iPods and computers are of dramatically reduced fidelity. The loss is exacerbated by the use of ear buds, which further diminish sound quality. The question is: Does anybody really care? For listeners of a certain age, the answer is a definitive no -- even for educated listeners who know the difference. "I have good headphones for when I'm working in the studio," says Johann Frank , a 19-year-old student at Berklee College of Music. "But right now I mainly listen to music on my cell phone, because my iPod died. The quality isn't that bad. Well, it is that bad. But I'm willing to make the trade. I need to have music with me at all times." Consumers made a similar trade during the cassette era, when the introduction of the Sony Walkman freed music lovers to transport dozens of poor-quality songs to the gym. And certainly young people today care about audio quality in certain contexts -- specifically video games, which have become renowned for lifelike sound reproduction and are enhanced by surround - sound speaker systems. But when it comes to listeners' personally assembled soundtracks, the convenience of downloading an entire music library and popping it into your backpack is -- for people who've grown up with it -- a given. Stillman's mother, Laurie, observes the change with a mixture of regret and resignation. "When I was young you showed people how serious you were about music by the size of your speakers," she says. "Now our speakers are furniture." Since the iPod was introduced in 2001, more than 90 million have been sold worldwide. Along with the typical ear bud, the market has been flooded with accessories that stress fun rather than the quality of the sound. With Chat Divas Barbie , the doll's tiny, battery-powered karaoke machine doubles as a speaker. For the Movin' and Groovin' line of potted plants, the plants have been programmed to shimmy while music plays through a speaker hidden in the pot. Then there are iPals , plush creatures with tiny speakers for eyes. But a recent influx of new devices devoted to audio rather than whimsy suggests that some manufacturers are hopeful that more users are eager for a better listening experience. Sony, Denon, Sennheiser, and Shure have all recently introduced high-end ear buds, ranging from $50 to more than $200, that promise a crisper, brighter, and detailed sound thanks to advanced filters, isolation, and noise-reduction. In October, Framingham-based Bose introduced "in-ear headphones," a name intended to differentiate Bose's product from the cheap, mass-market buds that are packaged with digital players. At $100 a pop, they're purported to offer range, realism, and clarity far surpassing conventional ear buds. Bob Luppino, the technical marketing manager for Bose's headphone division, says that they've been an instant hit with consumers. "An MP3 player is a charming device. You can carry your record collection with you, and that's very powerful. But there comes a point when you start to reflect a bit," Luppino says. "Could I make this experience better? What we're seeing now is a market for those seeking a little better quality. That's the fuel for the growth in the headphone market." Manufacturers of music players are following suit, designing MP3 players that claim to restore some of the audio information that is lost when the digital file is created. Toshiba , which makes Microsoft's Zune as well as its own line of Gigabeat players, has developed a "Harmonics" feature that uses a software algorithm to calculate which lost sounds were likely to have been in the original recording, and makes educated guesses in order to simulate them. Earlier this year Creative Technology, the parent company of Andover-based Cambridge SoundWorks , launched a product called Xmod , a small outboard device that attaches to a computer or digital player and promises to make MP3 files -- from the cymbal crashes to rumbling bass -- sound studio-caliber. "It's all hype," says Jonathan Wyner , mastering engineer and producer at Cambridge's M Works studios, and owner of two stereo systems and three iPods. "You can apply some EQ and ambient simulation and try to guess what was there, and try to paint the same picture. These devices may be higher quality than their counterparts. But if you use a lossy scheme" -- a format involves information loss -- " you're throwing something away on purpose, and it can't be restored." In fact, industry experts agree that a time will come when high - quality audio and ease and portability won't be mutually exclusive. Wyner believes that we're probably three to five years away from widespread use of so-called "loss-less" compression schemes, which require broader bandwidth and storage space. "We'll be able to store CD-quality files, transmit them across the next-generation Internet, and see higher fidelity creep into standard practice." That's good news for audiophiles -- yet something of a non-event for many consumers. Fred Pinkerton , product manager for the portable audio line at Cambridge SoundWorks, believes that "there will continue to be a small percentage of people interested in the best quality audio." "They just want to get the song." Joan Anderman can be reached at anderman@globe.com. For more on music visit boston.com/ae/music/blog. YOUR VIEW: Are you willing to trade sound quality for portability?